Many ideas that were born in Mannheim have changed the world's face. And a number of small workshops in Mannheim turned into renowned international enterprises! Karl Friedrich Christian Ludwig Freiherr Drais von Sauerbronn who invented the predecessor of the bicycle in 1817 (also refer to the multilingual website hosted by ADFC Mannheim: www.karl-drais.de). 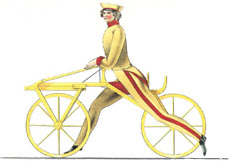 His running machine was called a "velocipede", and sometimes also "Draisine", although the latter name is more often associated with the foot-powered four-wheel rail vehicle he developed in Karlsruhe in 1842. Other inventions made by Mr. Drais included a piano recorder that recorded the first keystrokes on a paper tape; the earliest typewriter with a keyboard for 25 letters in 1821, which he developed further in 1829 into a stenograph machine with 16 keys and for the first time with a punched paper tape. In the year 1848, 27-year-old jeweler (!) Friedrich Engelhorn built an illuminating gas factory and provided light to the city of Mannheim. The coal tar, a brightly colored waste product of the process, made Engelhorn realize that the future belonged to synthetic colors. He founded the "Badische Anilin- & Soda Fabrik" in the Mannheim Jungbusch district. Later on, BASF moved to Ludwigshafen on the other side of the river Rhine. He was followed by Dr. Carl Benz who developed the motorcar in Square T 6, which was patent-protected in the year 1886, thus becoming the first useful automobile worldwide. Even today, his name is world-famous – after all, Janis Joplin was not the only one to want a Mercedes Benz. The fact that the group headquartered in Stuttgart recently refused to include the name of Benz, the inventor of the automobile, in the group's new name after having separated from Chrysler was a source of great disappointment in Baden. The developments created in Mannheim which then conquered the world also included the Lanz-Bulldog, a farming tractor that made farmwork much easier for farmers all over the world. It was Dr. Ing. Fritz Huber who developed the glow-head single-cylinder motor into the "Bulldog". The Mannheim production facilities were acquired by John Deere in 1956. In 1972, five young programmers set up an office in downtown Mannheim. Their names were Claus Wellenreuther, Hans-Werner Hector, Klaus Tschira, Dietmar Hopp and Hasso Plattner. The established the company "SAP System Analysis and Product Development" and developed management software for medium-sized companies. Meanwhile, the product range has grown considerably. The group is represented on all five continents and employs 36,000 people worldwide. Later, the founders relocated their headquarters to Walldorf, the town that became world-famous through the Astor family of emigrants who named their New York hotel "Waldorf Astoria"!